Eduardo Bolsonaro, son of Brazilian President-elect Jair Bolsonaro, met on Wednesday with US President Donald Trump's son-in-law and adviser Jared Kushner. Bolsonaro wrote on Twitter that Kushner is one of the White House's most important advisers and a great entrepreneur, besides being President Trump's son-in-law. 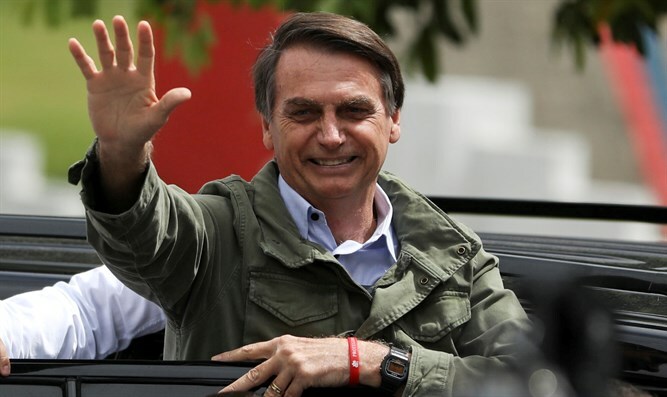 According to a report in Reshet Bet, the son of the Brazilian President-elect stressed at the meeting that the Brazilian embassy in Israel would move to Jerusalem. Last week, a delegation comprised of South American leaders and Christian supporters of Israel toured Samaria in an attempt to learn more about the region. The delegation included Carlos Kiroa, a close friend of Bolsonaro who predicted that he would end up moving his nation's embassy to Jerusalem despite Arab pressure not to.